A delightful ape whose evocative pant-hoot call is a definitive sound of the African rain forest. Uganda is a home to man’s closest relative, the Chimpanzee. Chimpanzee communities have been habituated for tourism at Kibale forest, Budongo Forest, and Queen Elizabeth National park’s kyambura Gorge. A community of orphaned chimps, most of which were confiscated from poachers, can be visited on Ngamba Island, which lies on Lake Victoria. 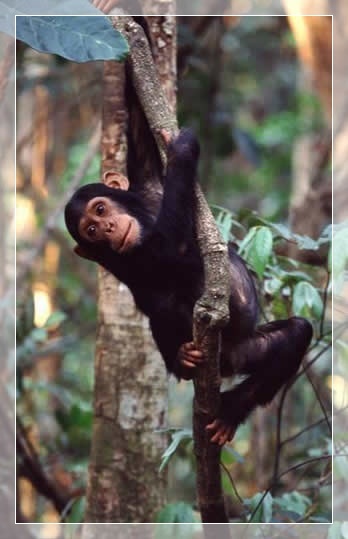 There are 5 recognised sub-species of chimpanzee within Africa; Uganda is home to the ‘Pan Troglodytes Schweinfurthii’ sub-species, also known as the Eastern Common Chimpanzee. Unfortunately, contrary to its more wildly used name, the Eastern Common Chimpanzee is actually classified as endangered. In fact populations of chimpanzees have already been wiped out in 5 central African countries. Fortunately Uganda has in recent years adopted a very successful conservation strategy, with the money made through National Park fees, gorilla tracking permits, chimpanzee tracking permits, etc being reinvested into the conservation of Uganda’s native wildlife. Consequently a recent chimpanzee census has actually shown that numbers of chimpanzees have actually grown in recent years. Visit Uganda the best place in the whole of Africa for chimpanzee tracking.